Material Make-up: Silver Tone Base Metal, Hard & Glitter Enamel. Predominant Colors: Black, Tan, Red. States Limited Edition 100 on the back of each pin. These pins measure 3 x 2.5 inches. Very difficult to find these now. This is our only set don't miss out. You may never see some of these ever again! If you collect these pins please keep checking in with us to see what we have available. 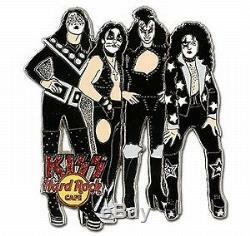 The item "KISS Hard Rock Cafe Pin Group Flex LE 100 2006" is in sale since Sunday, July 27, 2008. This item is in the category "Entertainment Memorabilia\Music Memorabilia\Rock & Pop\Artists K\Kiss\Novelties". The seller is "kissarmywarehouse" and is located in Indianapolis, Indiana.